Neue, renovierte Zimmer. Kostenloses Internet-, Sicherheits-Schränke, Wäsche-, CCTV, Handtücher, Fön und Parkplatz. Vermietung Betten, Zimmer zur Übernachtung oder Tage Pause. Öffnungszeiten von 0 bis 24 Uhr. Genießen Sie die Ruhe und Schönheit unserer luxuriösen Zimmer und bequeme Betten, große Terrasse, mit anderen Gästen im Wohnzimmer zu sozialisieren oder kochen in unserem voll ausgestatteten Küche (zwei Kühlschränke, Mikrowelle, Geschirrspüler, Saftpresse, frizeza, Toaster). Definitely recommend! Nice rooftop area with many flowers and plants, ideal for relaxing. Very clean rooms and comfy beds. 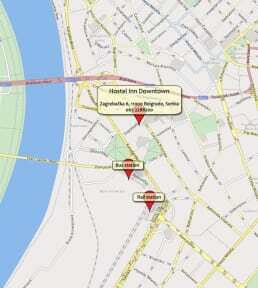 Located very close to railway station and old town. Super friendly and welcoming staff. This how a downtown Hostel should be. Clean rooms and bathrooms, safe, friendly staff with a lot of good advices for the guests. It was the perfect place to rest during my bicycle trip from Hamburg to Varna/Bulgaria. It is on the 6th floor but the view from the rooftop is worth it to climb up. I definitely stay there again on my next trip to Belgrad! Very nice hostel with friendly staff and a beautiful terrace. Clean and cosy. 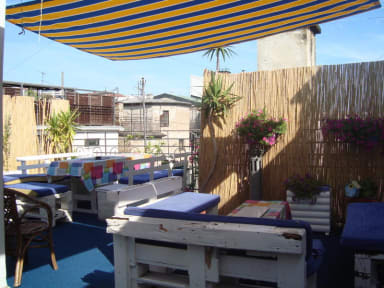 The hostel itself is small, but with the roof terrace you have a lot of extra space you can use, which is a real plus. Hostel is in a good location. Friedly staff. Good atmosphere. It's really close to the bus and train station, but up in the 5th floor. The place was clean and the stuff very friendly. They also have a really nice balkony. For the price it is a really nice hostel. The rooms are small, the common areas as well. The staff cannot really help with informations and not everything is completly clean. However they have an amazing spacious terrace, the staff is really friendly and the atmosphere is great. So best place for independent low budget travelers. Room was very dirty. There also is an internet cafe, people in the hostel screaming all day and night, only bathroom right there. So you need to pass when going to toilet or showering. Wanted me to pay more than actual price cause I had a hostel world reservation. Was then kicked out the last day as I wanted to read a book in the common room even though I was sick, which the employee knew. Had to wait at the bus station for four hours freezing very badly. Worst experience!